A US National Weather Service map shows precipitation levels across the southeastern US on October 4, 2015. 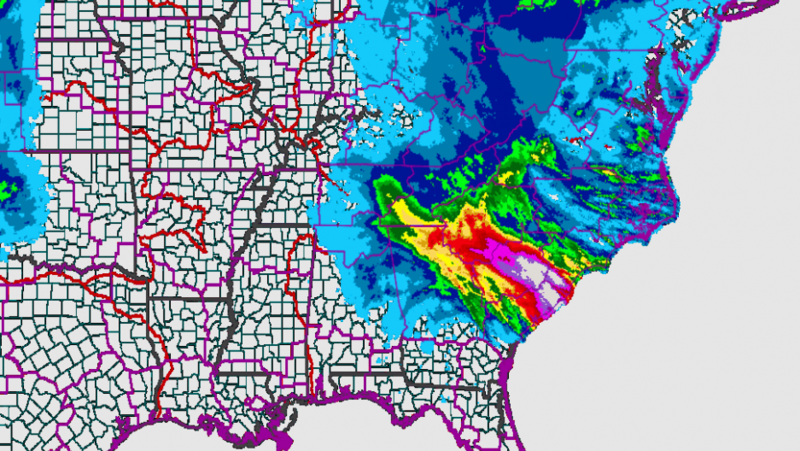 White splotches in South Carolina indicate areas with more than 10 inches of rain. Twenty-seven inches of rain over five days. More than 15 inches in just 10 hours. Those are just a couple of the unfathomable amounts of rain that fell in parts of South and North Carolina last weekend in the storm that killed at least 17 people and caused in the neighborhood of $1 billion in damage. Meteorologists called it a “thousand-year event” — meaning a deluge that’s likely to happen only once in 1,000 years, but they may have to change their odds as the planet warms up. Already this year there have been two such supposedly rare rain events, and many other rainfall records set, in the US. June was the second wettest month on record in Illinois and neighboring Indiana and Ohio set rainfall records that same month. And don’t forget the record amounts of snow that fell on New England last winter. And what’s going on isn’t just the usual clustering you often find among random events. When it rains these days, Henson says, it often rains harder. In other words, warmer temperatures may not be causing such storms, but they are helping feed more water into storm systems. The particulars of the storm that battered North and South Carolina were a classic example of random weather events combined with the effects of the upward temperature trend. “We had a upper-level low-pressure center (that) sat over the southeast for several days,” Henson says. “That brought in a lot of forcing to pull the air upward and make it rain.” And the rainfall was in turn fed by an unusually moist atmosphere in the region. The growing number of deluges bring lots of problems with them, but Henson, who wrote his master’s thesis on flash flood warnings, says one of the biggest may just be getting people to take the threat seriously. He says the heavy rains in the Carolinas were pretty well forecast, and local officials were fairly well prepared, but regular folks still ventured out into the storms when they’d been warned not to.